With just over three weeks until Earth Day 2011, Greenpeace today continued its efforts to convince Facebook to adopt a policy of clean energy to power its data centers. The latest moves in Greenpeace's "Unfriend Coal" campaign, which we've been covering for more than a year -- see here, here, and here for some of our coverage -- is hoping to pressure the social network to switch from coal and nuclear power for its data centers and embrace renewable energy technologies like so many of its IT industry peers. As the world's largest social network, with 600 million members, Facebook is a prime target for the environmental group's campaigns. Although it's far from the most powerful player in IT, Facebook has the dual distinction of having such a large profile while also not committing to green power for its data centers, unlike most of its peers. I profiled Facebook's green efforts last November, finding that the company is focused on energy efficiency and helping to shift the industry, as well as providing links to green news through its Green on Facebook page, but is building and leasing data center space that's largely powered by coal and nuclear energy. Prior to this week's news, Greenpeace had focused on coal as the primary dirty energy source, but in the wake of the tragic earthquake, tsunami and nuclear crisis in Japan, nuclear power has also made an appearance in the Unfriend Coal campaign. Greenpeace is urging Facebook to pledge to wean itself off of dirty energy by Earth day, and today has posted its latest video in the campaign, which you can watch at the end of this post. But more helpful is a seven-page media briefing that Greenpeace has created that lays out the scope of Facebook's impacts, as well as five steps the company can take to meet Greenpeace's call to action. 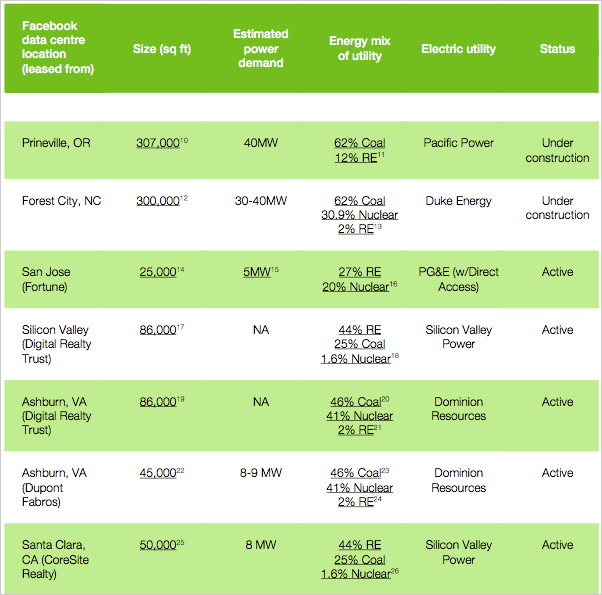 Greenpeace has cobbled together a first-ever look at Facebook's computing footprint, as well as its estimated energy use and the sources of that energy; as you can see in the chart below (click the image or this link for a full-sized version), the greenest of Facebook's compute facilities is the still-under-construction Prineville, Ore., data center, with 12 percent renewable generation. The company also leases some fairly green space from Digital Realty Trust in Silicon Valley, which is 44 percent powered by renewables. 1) Come clean: Disclosure of energy and carbon footprint. Facebook ... has yet to provide any data on its energy consumption or related GHG emissions at either a corporate or facility level, but instead wants to focus attention on the anticipated PUE (Power Usage Effectiveness) of the Prineville and Forest City data centres. Unfortunately, PUE is a broad efficiency metric for comparing total power consumption to computing power consumption, and does not provide any indication of the type of energy consumed, or measure the amount of carbon associated with its operations. 2) Infrastructure siting policy. Given that Facebook has recently made what are likely the first two major investments in a series of large data centre infrastructure builds to support its rapid growth, the adoption of an investment and siting policy that factors in available renewable energy resources is critically important to achieving a coal-free Facebook. 3) Increase the supply of clean energy. 4) Clean energy advocacy. Ultimately, we need Facebook to work with Greenpeace and other corporate and public sector advocates to engage decision-makers in Oregon, North Carolina and elsewhere and push for policy changes that will rapidly move us off of coal and onto renewable energy.... Facebook and other large IT companies, such as Google, Yahoo! and Microsoft, have the power to make real changes to the grid mix at a much faster rate than the present. If Facebook and other cloud services want to provide a truly green and renewable Internet, they must use their power and influence, not to only drive investments near renewable energy sources, but also to help set the policies that will rapidly deploy renewable electricity economy-wide. 5) Educate and engage Facebook members on clean energy. With its tremendous user base, Facebook can play a unique role in creating broad awareness and discussion about the need for a clean energy transformation. The video is below, and more details are online at Greenpeace.org.